Comments: Powhatan Bledsoe was born in Fluvanna County, VA, in 1832, and graduated from the University of Virginia Medical School in 1858. When the Civil War broke out in early 1861, Dr. Bledsoe was living in Henrico County, VA, and his record as an assistant surgeon in the C.S.A. began that spring when he passed his examination before the Army Medical Board in Richmond, VA. Midway through the war, Dr. Bledsoe was ordered to report for duty at the Confederate hospital in Scottsville on 13 January 1863. 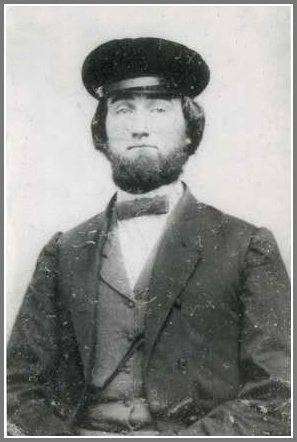 He was relieved from duty in Scottsville on 17 September 1863 and assigned to field duty. Dr. Bledsoe was captured at Fort Fisher, NC, on 01 January 1865. In 1908, Dr. Bledsoe recorded the often traumatic highlights of his CSA medical career in the membership application of his niece, Mary E. Beal of Scottsville, to the United Daughters of the Confederacy (UDC) in Virginia. "My record in C.S.A. army commenced in the Spring of 1861. My examination before the Army Medical Board in Richmond, VA, having been passed, I was ordered by Surgeon General Moore to report to duty to Dr. Tom, Surgeon in charge of Seabrooke's Warehouse Hospital, Richmond, VA, which was full of wounded from Seven Pines, the battle then going on below Richmond. I remained at Seabrooke's about 10 or 12 days, then rec'd orders to report for duty to Col. E.B. Montague, in charge of 32 VA Regt., Sime's Brigade, McLaws Div., on the 9 mile road below Richmond. I found Col. Montague receiving upon some plank, the wreck of an old house, and leisurely watching the Yanks just across the river, who he said had the audacity to drop him an occasional salute in the form of a blue pill from the mouth of an artillery piece. Handing Col. Montague my orders, he rec'd me cordially and offered me the privilege of the best quarters I could find about the old demolished building." "I remained with the 32 VA through the 7 days fight below Richmond, then after Manassas or Bull Run fight, crossed the Potomac at Rock Camping near Frederick City, passing into Maryland. During this march, many of our men underwent great suffering for food and clothing as well as from sickness. Some of them could have been tracked for miles by blood from their feet. As Gen. Lee forbade foraging, we often satisfied our hunger with apples and green corn. To show the extreme desperation of some men, I will here state what I witnessed that March. Col. Montague stationed a guard around his headquarters, who were ordered to prohibit any passing within a certain line, which was the nearest way to the spring. A private of another regt., attempting to pass, was halted, and refusing to turn his course, the sentinel was ordered to bayonet him. With an oath, he refused to turn and said he would have water or die, and made the trip without further resistance." "We passed through the Sharpsburg battle, crossed back into VA at Shepherdstown, and camped in the valley of VA. At this place, I being too sick to discharge my duty as surgeon, got leave of absence for 60 days. At the expiration of which time, I rec'd orders to report for duty to Dr.J.M. Jefferies, General Hospital, Scottsville, VA. Here I remained until the fall of '63, being then ordered to report for duty to Medical Director A.M. Fauntleroy, Wilmington, NC. Fauntleroy, an old college mate, rec'd me kindly, giving me the best place he had unfilled: Fort Fisher, 20 miles below Wilmington at mouth of Cape Fear River, where I remained until the capture of the Fort, Jan'y 1865." "It was captured after two engagements. Col.Wm. Lamb of Norfolk in command. Gen. Whiting, Maj. Gen., and Gen. Heber, Brigade Commander. I suppose it was more stubbornly defended that in the history of this war, or any other, ancient or modern. In the first attack, the Federals, after 3 days and nights of continual cannoning, attempted to land their men from their navy and were repulsed. The second attack, about the middle of Jan'y, lasted 3 days and nights. They threw 160 shot and shell on us per minute from their gun boats. (A braver man than Col. Lamb never gave nor obeyed a command) There was no possible chance for any living being to escape with life outside of a casement under the ground. There were about 1900 men in the fort. It was taken at night and in the morning following, a regiment of Yankees stacked arms and were getting breakfast near a magazine in which was stored 13 tons of powder. I suppose some one of the number foraging went into the magazine with a match, igniting 13 tons of powder. I was in a casement with my sick and wounded about 5 yds from the magazine. It was terrific. I (not thinking of the real cause) thought the end of time had come. My second thought was that we would soon see the right and wrong of this war. There were only about 60 Confederates in the fort at the time -- all officers. They were drawn up in a line and each questioned regarding the cause of the explosion. At the same time, we were informed that if it was proven to be caused or done by us, the last one of us would be shot. " "We were then put on board a screw propeller, the 'California,' and taken to N.Y. harbor and were then informed that Gen. Eaves had investigated the cause and had concluded that the Rebels in the fort did it to kill the enemy and each of them would be executed, I being one of them. In a few days, we were informed to our great relief, that it had been concluded that the explosion was an accident. I was shown many kindnesses by the Medical Dept. of the Federal army and promised when taking leave of them that I hoped to be able in the near future to return their kindness. They politely begged to be excused if it was to be tendered under similar circumstances. I remained prisoner at N.Y. harbor until some time in March -- three months -- and returned to Richmond and was sick of typhoid fever until after the fall of Richmond. I recall an incident on our march from Maryland. I saw two ladies in bloomer suits with bowie knives in their belts on the roadside. One of them remarked, "I wish I was dead." 1) Application of Mary E. Beal to United Daughters of the Confedracy, Virginia Division, Scottsville Chapter, Henry Gantt Camp C.V.75; 23 September 1908. Collections of Scottsville Museum, Scottsville, VA.
4) Richard Nicholas, Charlottesville, VA.
5) Service Record for Powhatan Bledsoe, Assistant Surgeon, 32nd Regiment, Virginia Infantry, Company F&S; U.S. Civil War Soldiers, 1861-1865. Film No. M382 Roll 5.